Beneath the forest canopy of High Ridge is an emerald green, full of luscious moss, and sparkly glints of delightful photographic happiness. According to our experience, it also rains lots on weekends. Drowned Rats: Christine, Paul, Danniel, Mike. 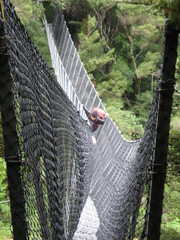 Huts visited: Holdsworth Lodge (1 night), Totara Flats (1 night), Powell Hut (0 nights), Mountain House (shelter, 0 nights). This post is a trip report. You can find other trip reports about other places linked from the Trip Reports Page , or by browsing the Trip Reports Category . On Friday night, we shared the bus to the Holdsworth road-end with those involved in the introductory bush-craft course. 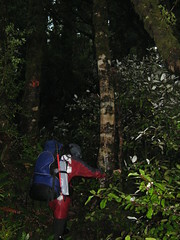 Our own objective, as a trip focused on building navigation skills, was to walk up past Powell Hut, along High Ridge to Flaxy Knob, and then bush-bash our way down to Totara Flats. The forecast was never good for the weekend, but it suggested that Saturday might have some reasonable weather. Unfortunately, it didn’t. Before we reached Mountain House, we decided that the low, fast-moving cloud that obscured High Ridge made it pointless to continue. Instead, we back-tracked and headed straight for Totara Flats. Plan B was to hope that the weather would clear enough to leave early on Sunday morning and do the trip in reverse. Even getting to Totara Flats was an interesting experience. Marie and I, at the front of the group, accidentally walked onto an older unmaintained track. We became suspicious after a short time, and while Marie went to scout ahead, I stayed where I was and kept an eye on what I thought was the point where we had left the main track behind us. It turned out that it wasn’t, and by the time Marie had returned and we figured this out, Christine had already walked past the point where we’d left the main track. We found Paul and Danniel, who had been quite a lot further behind, but they weren’t 100% sure where Christine was, except that they hadn’t passed her. Marie and I then spent the next 30 minutes scurrying back to where Marie was sure of having definitely seen her last, while Paul and Danniel continued to the hut with an arrangement of coming back to help if we hadn’t turned up within a couple of hours. With all the wind, the swing bridge over the Waiohine River was in full tilt, making it a crossing worthy of an amusement park. Marie bruised her arm when holding on during one of the more violent gusts of wind, and seemed quite proud of it afterwards. We reached the Totara Flats Hut at about midday, happily discovering that Christine was there, and had been quite concerned once she arrived and found that we hadn’t. It was there that we unpacked and stopped for lunch. Despite the confidence that we had in the barometer on Paul’s shiny new watch, which indicated the weather was improving, it was about now that the rain really started to kick in. After Danniel had lit the fire, Marie took the opportunity to give us some brief lessons in navigation techniques. Not wanting to sit around for the afternoon, we then found our wet-weather gear, and set out for a leisurely swim around the flats. We had earlier considered the idea of crossing the Waiohine River and looking for Sayer Hut. One look at the amount of rapidly flowing dirty water, however, made it clear that attempting a crossing would be a very bad idea. Instead, we satisfied ourselves with figuring out where we’d expect Sayer Hut to be. Paul also took us to the fireplace remains of the second Totara Flats hut that was built in the 1970s, before it was moved due to a risk of flooding. By the time we had reached the far end of the flats, we could go no further. 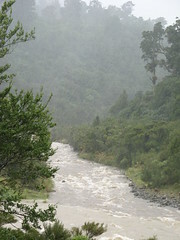 The stream flowing into the Waiohine at that end was impassable, and we turned around. The rapid effect of the rain was obvious. Even a small creek part-way along the flats, which we had easily stepped in an hour before, had risen considerably in the course of an hour such that we had to think carefully about where to cross on the way back. Danniel kept the fire going nicely that night. With the torrential rain hammering on the roof, we had the hut to ourselves. We amused ourselves with thoughts of what it might be like outside under flies, which was what had been planned for people taking the bush-craft course. Marie woke early on Sunday, and determined that although the wind had died down enough to make it feasible to visit High Ridge, it could also be a miserable trek when we reached the exposed areas on the top. Once she explained this, we sadly decided on plan C, which was to return to bed and sleep in. Afterwards, we’d have a relaxing walk back to Holdsworth Lodge, hopefully interspersed with some technical river crossings through the higher-than-usual creeks along the way. For the next hour, I kept myself entertained by gazing out the window from the top bunk, hoping to see a large tree or two being carried down the river. It was sad that our expedition was to be a fairly simple return trip to Totara Flats, but it was a good decision at the time. The swing bridge was calmer than the previous afternoon, consistent with the wind having died down. When we reached the first of the minor creeks later that morning, however, there was even more water than we had anticipated. 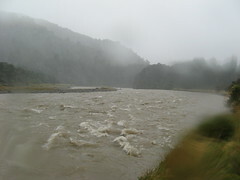 A small trip while crossing could have easily meant being washed into an overfilled Totara Creek, and then into the dangerously flooded Waiohine River. We considered returning to the hut for an extra night to wait for the waters to subside, but finally decided on plan D, which was to give High Ridge a try. Despite the conditions, it was sheltered under trees for most of the way. We would still have the option of returning if it looked to get too much worse, as well as the option to stay at Powell Hut if we ran out of time to reach the road-end. As we’d left later than anticipated for following this route, however, we’d need to move fast to get back by the end of the day. The cairn that marked the start of the route up the spur was only five minutes along the rather saturated bog of a track behind us, and Marie led the way to Flaxy Knob. It was necessary to keep moving to stay warm, so everyone had a ready supply of high energy snacks to munch on during the walk up. We were now in more of a hurry, and unfortunately there wasn’t as much opportunity to experiment with navigation techniques, or even to stop and take photos. Besides the great scenery along the ridge under the tree canopy, the highlight for me on this section of the trip was surviving a fall. I chose the wrong branch to support my weight when traversing a narrow section straddling around the hillside, toppled off a vertical drop for a metre or two, and ended sliding some distance backwards down a steep bank on my pack. By the time I’d realised what had happened, I was staring up the hill at Danniel, Paul and Christine about 10 metres away. Having surveyed everything that missed me on the way down, I think I was very lucky to have come away without a scratch to show for it, although Christine had to help me re-attach the hood of my raincoat. I guess packs are good for these types of things, and the tendency of mine to roll underneath and act as a landing pad probably saved me from at least a few broken bones if not much more. After climbing back to where I’d started from, I was still a little shaken. Marie needed to point out several times, before I comprehended, that I was about to put my weight straight back on what remained of exactly the same rotten branch all over again. It could easily have been worse a second time, but thanks to Marie’s alert observation, I definitively conquered that five metres of the route, and hopefully came out of the whole thing a little wiser. Take THAT, nature! The weather began to clear as we ascended, and the rain had even stopped by the time we’d dragged our packs through a few branches of Leatherwood to poke our heads above the bush-line. It was windy walking over the tops, but passable with caution. With the clouds having cleared, there were also some brilliant views back over High Ridge. It was just before 3pm by the time we reached Powell Hut, which had actually been our arranged time to meet with the others at the lodge. Marie took the opportunity to start making phone calls to report that we’d be late. Danniel spent a few minutes composing a verse for the hut book, and the rest of us attempted to quickly eat some proper lunch. It was unfortunate that a sign inside Powell Hut had an incorrect phone number for the DOC ranger at the Holdsworth road-end. We thought to dial 018 to ask for the number, but the nice man from Telecom didn’t actually know where “Holdsworth” was, let alone the ranger’s office at a road-end, so couldn’t be of much help. Having been unable to contact anyone, we decided to just try our luck walking out, hoping that the bus would wait a little longer for us. With a clear track from Powell Hut, stalled only by a widely berthed platoon of people walking their dogs near the lower end, the remainder of the trek was fast compared with what we’d had until then. It eventuated that the bush-craft group had decided to wait until 5pm, having sat around for the better part of the afternoon. A very reasonable assumption had been made that that we were probably stuck between flooded rivers at Totara Flats. 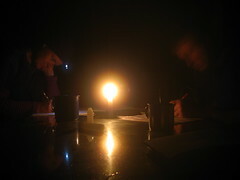 A detailed note had been written and left for us at the lodge, the ranger had been notified of an overdue party, and our situation had been used as an example in front of the bush-craft attendees of how easy it is to be delayed for extra nights when tramping near rivers. By a fortunate coincidence for us, 5pm happened to be the exact time that I walked out. I was quite bemused to see a bus full of people, who let out cries of surprise as I walked past the window, followed by a collective groan as I poked my head in the door and indicated that the rest of the group might take up to another half hour to arrive. Supposedly the only thing that had held them up was Glynne’s decision to change his shoes before returning to drive the bus away. Not that we minded, of course: our ride home had been saved. 7 Comments To "Trip: High Ridge, Totara Flats"
That’s true. It’s impressive what can fit into a weekend.